A space elevator would extend 22,000 miles above the Earth to a station, and then another 40,000 miles to a weighted structure for stability. (PhysOrg.com) -- Scientists from Cambridge University have developed a light, flexible, and strong type of carbon nanotube material that may bring space elevators closer to reality. Motivated by a $4 million prize from NASA, the scientists found a way to combine multiple separate nanotubes together to form long strands. Until now, carbon nanotubes have been too brittle to be formed into such long pieces. And a space elevator - if it ever becomes reality - will be quite long. NASA needs about 144,000 miles of nanotube to build one. In theory, a cable would extend 22,000 miles above the Earth to a station, which is the distance at which satellites remain in geostationary orbit. Due to the competing forces of the Earth's gravity and outward centrifugal pull, the elevator station would remain at that distance like a satellite. Then the cable would extend another 40,000 miles into space to a weighted structure for stability. An elevator car would be attached to the nanotube cable and powered into space along the track. NASA and its partner, the Spaceward Foundation, hope that a space elevator could serve as a cost-effective and relatively clean mode of space transportation. NASA's current shuttle fleet is set to retire in 2010, and the organization doesn't have enough funds to replace it until 2014 at the earliest. To fill the gap, NASA is hiring out shuttles to provide transportation to the International Space Station from private companies. So NASA could use a space elevator, the sooner the better. Space elevators could lift material at just one-fifth the cost of a rocket, since most of a rocket's energy is used simply to escape Earth's gravity. Not only could a space elevator offer research expeditions for astronauts, the technology could also expand the possibilities for space tourism and even space colonization. Currently, the Cambridge team can make about 1 gram of the new carbon material per day, which can stretch to 18 miles in length. Alan Windle, professor of materials science at Cambridge, says that industrial-level production would be required to manufacture NASA's request for 144,000 miles of nanotube. Nevertheless, the web-like nanotube material is promising. "The key thing is that the process essentially makes carbon into smoke, but because the smoke particles are long thin nanotubes, they entangle and hold hands," Windle said. "We are actually making elastic smoke, which we can then wind up into a fiber." Windle and his colleagues presented their results last month at a conference in Luxembourg, which attracted hundreds of attendees from groups such as NASA and the European Space Agency. John Winter of EuroSpaceward, which organized the conference, thought the new material was a significant step. "The biggest problem has always been finding a material that is strong enough and lightweight enough to stretch tens of thousands of miles into space," said Winter. "This isn't going to happen probably for the next decade at least, but in theory this is now possible. The advances in materials for the tether are very exciting." FINALLY!!!!! The space elevator will solve all of our problems!!! We'll be able to lift heavy hardware, so we'll be able to build strong and big ships right there on space! Every terrorist group in the world is praying that one is built so they can go fly something heavily laden with fuel and explosives in it to destroy it! Imagine 35,000 miles of carbon nanotube ribbon falling back down to earth with a huge captured asteroid counterweight falling with it!! If it snapped the asteroid would fly away from the Earth and not fall back down. Furthermore most designs for a space elevator involve it being able to move at least slightly to avoid collisions with satellites, and also a no-fly zone around it in which anything will be shot down. Finally, we have a material strong enough to make those elusive boot straps...You know--the ones we will be pulling ourselves up with. Possibly... depends on how much further out from geosynch orbit the counterweight is and how much tension is on the ribbon. If only enough tension is on the ribbon to be able to lift a few hundred tonnes of mass then a passenger airliner slamming into the ribbon might impart enough force to snap tug the counterweight and all that additional ribbon mass into the earths gravity well.. So much fear and doubt. How do you guys get out of bed in the morning? Damn, they're stringing me along with all these tempting stories of space elevators.. 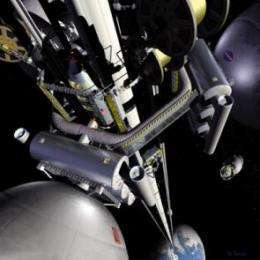 There are numerous issues with a space elevator that will need to be overcome. For example, once you place some cargo on it, it has to move through the atmosphere and is subject to wind forces which will be a constant drag on the satellite hosting the ribbon. The ribbon itself will have little drag because of its thinness. The tension over such distances is also not properly understood while the cargo is in the atmosphere. So a higher altitude attachment point is preferred. However, you also want an equatorial location to minimize "wobble" of the orbit. So you need to find the highest equatorial point, perhaps somewhere in Ecuador. Now perhaps the space elevator idea will be a lot easier to manage on the moon. However, I'm not sure how far off the surface it would have to be to match the moon's slow rotation - perhaps as far as the earth? Perhaps much farther? Oh yeah man, That shits highly conductive. We would probably be drawing megawatts out of the magnetosphere. I've read that if those Carbon Nanotube lines snapped, the line itself would just burn up in the atmosphere, and the station will be in geosynchronous orbit, so it would stay exactly where it was (it might recoil a little bit into a higher orbit, but not much). So there isn't any danger to these things. Mind you, that doesn't mean we'd want terrorists trying to snap the lines. It would be horribly expensive to re-string the station to Earth again. I am worried about some of the torques and high-altitude stresses though. AFAIK no one has worked out exactly how strong a cable would have to be to withstand those forces with a decent sized cargo hanging from the line. Wow. Great news. Not to mention just a year or so ago when I read about the concept they thought it was still at least a century or so and now they are thinking in a few decades!! The power of science should never be underestimated. A counterweight in space? where would the fulcrum be? If only there was some kind of aircushion to prevent the wire from reaching dangerous speeds, you know, like a 5 trillion tonne atmosphere or something? If only the cable could be made out of a thin ribbon of super-hard material that would slice through a plane like butter, you know, like carbon nanotubes? Oh and the counter-weight will probably be made from yet more carbon nanotube ribbon stretching further into space. No space elevator. :) Enjoy. LuckyBrandon, this material is being produced in a lab now. I don't think it's unlikely that with better techniques and mass production it could easily be sped up by a factor of a billion. Besides that, this technique is not good enough yet. The nanotube cable still needs to be quite a bit stronger to have an efficient design. At the current strength you need a heck of a lot of material to support it. With stronger cables you need much less. This material isn't even close to half the theoretical limit of carbon nanatube strength. this article states that is would reduce the cost to orbit by a factor of 5. More like a factor of a 100. The idea of "spinning smoke into thread" was awesome imagery! I think platinum is able to stretch much more than 18 miles per gram. The tubes have a tensile strength of 9 GPa, four times stronger than Kevlar. Here is more on the development, and feasibility of an elevator with this material. Look up the aramid fiber, Spectra, or Vectran (Vectra), it has a strength of 50k or 100k x stronger than steel, the caveat being that it is a calculation on weight vs strength. Way stronger than Kevlar, lb for lb. This stuff is so tough (molecular bonding) you can't cut it with extreme grade scissors or 10" pro sidecutters. It's absolutely miserable stuff to work with. When you DO get it cut, it fuses and it stinks of burnt plastic (avec smoke! ), which tells you flat out, that the molecular bonding is quite extreme (energy emissive when the bonding is broken). As for this idea of a 'space elevator', READ the Arthur C. Clarke Novel called 'The Fountains of Paradise' which introduced this subject to the world, in a science backed Sci-Fi novel. Arthur's elevator, was built in Sri Lanka, for the reasons covered here. Arthur covers all of the challenges. We are ALSO inches away fro Larry Niven's ideas on a thing in his novels he called 'Sinclair Molecule Chain', which is literally the kind of material needed here. Read Some of his works for a in-depth covering of the technical and social/cultural integration of that sort of material. If someone DOES create such a material- PLEASE have the common sense to be named 'Sinclair', OK? I suspect that any terrorists would choose to attack the cable at a very high altitude, preferably above the atmosphere. Maybe they'd use one of those new spaceships we'll be building in our new orbital shipyard to ram the cable or toss an asteroid at it. All of the cabling below the break would fall back to Earth with incredible momentum. The higher the break (up to a point), the more damage it does. There's an excellent graphic description of just such a catastrophe in Kim Robinson's "Red Mars" book, and he appears to have done his physics homework. The impact zone wraps several times around the planet and, near the end of that string, the effect is like a continuous string of nuclear bombs (only without the radiation). Screw the space elevator. I like that idea of putting a very massive weight (lifted in sections) into orbit with a tether behind it. Then you outfit those suborbital space planes that seem to be good for nothing but giving rich folk a few minutes of over priced enjoyment and attach a magnetic grapple so it can grab the tether without ripping itself to shreds. As the tether moves through the grapple the magnets leach energy of motion to accelerate the suborbital ship to orbital velocity and only slows the large orbital tow mass to a slightly lower orbit. The orbital mass is then returned to a higher orbit slowly with very efficient but low power ion engines over a longer time frame. This would let you fly people and cargo to space in a small ship with far less fuel weight except for the occasional heavy load of fuel for the ion engines. But these carbon cables are nothing to sneeze at. there are going to be a lot of uses for then in space and more down to earth construction and engineering jobs. Not too long ago they thought this idea would be impossible, now they have a way, even though its not perfect yet my guess is in the next few years they'll have another way that will work a lot better, and so on, besides soon we'll be in the point where amazing scientific discoveries will be made almost every minute overlapping each other and things we never dreamed of will be possible, so I wouldn't dismiss any ideas they come up with. But.. a space elevator would be pointless if they came up with a way to fly using magnetism instead of way too much fuel. For the reasons nkalanaga and others have said, the concept will always be at the BOZO level. It would be less practicable than building a 300 km tower. Babel on. the terrorist comment was really lame - laden planes only fly into things when they are on autopilot. Induced currently in the space elevator will be one MAJOR drawback. This wire will cut through earth's plasma sheaths providing a near direct route for energy to pass from space to earth. it will get fried! great idea. i hope they try it. but i doubt it will be feasible, at least not in one great long wire from heaven to earth. Induced current comes at a price. In this case, a lower energy orbit. It's the ol' action/reaction Newton thingy. When you try to get something for nothing, you usually get the reverse. Just ask Our Lady of Perpetual Motion. nkalanaga, I don't agree. What could you possibly mean by "counterweight?" Do you mean a "sky hook?" Consider how induction works. If you take a wire or coil and run it by a magnetic field, it will induce a current but it takes energy to do that. In this case, it will rob the spacecraft of just that amount of energy that was produced by the field/wire arrangement. It's not like solar cell panel where you actually collect free enregy via photons. Remember, a rocket engine is fairly ineficient. The cost in fuel is to high to have it sapped away by this contraption. You wouldn't put a windmill on top of your car to run your air-conditioner. The drag would be prohibitive. Heres my question, suppose we get these little robot spiders to string the strands one at a time, or however they do it, at what point to they embed the power lines into the middle of the tether? logically, the first strand would be the center strand, right? 1/5th the cost of rockets? Current or theoretical? Sea Dragon was thought to have mass to orbit costs 1/4 or less of saturn 5. No special tech required. Even at 1/5th the cost, tether to electricty is not only impractical, it's insane. Also, long voyages of heavy manned vehicles without nuclear energy would be unthinkable. For the life of me, I never understood why NASA wasted any time with the tether experiment. What was the point? The point was to equip the shuttle with an ultraviolet camera system and watch how many extradimensional beasties would gather around a high energy source in high earth orbit. here again you are suggesting that energy can be collected without a complete circuit. to generate power in this way there would have to be a return sytem for the electrons to return to the atmosphere. All, I repeat ALL electrical circuits form a complete loop. I think you need to read up on your tesla. no you need to try and do what you say in any test configuration. All electrical circuits are a balance of flow and return. It could be conceived that static does not fit this fact but static cannot be used to drive or power any applience. Electricity is not a substance like water which flows. I can back this with a lifetime of work. Returning to your comments re Tesla, what I imagine you are talking about are his transmission of electricity through the air. what you do not realise is that for ny device to use this type of transmission it had to be earthed (connected to the ground) this is what provides the return the ground itself. Non of Tesla's experiments are unexplainable and all include a complete loop circuit in some form or other but this may not be imeadiately obvious. let me offer you further evidence: some time ago an attempt to generate electricity was done by towing a single cable behind an orbitibg craft so that the cable passed through the earths magnetic field. It did not work and the cable blew itself apart. It would have worked had they formed the cable into a loop and dragged this through the earth magnetic field. what happened was that the single cable generated so much static it blew apart in a form of lighning. If you would like to offer any example of flow without return for electricity I will be glad to explain how it is really working. Pretty interesting. My question to you, my learned friends is, can anything else be made out of this stuff? Would it work for body armour or to make planes stronger?